February is only a couple of days away, so I thought I would give you a sneak peek of the products we will be using in February's Stamping By Mail class. I am so excited for this class. 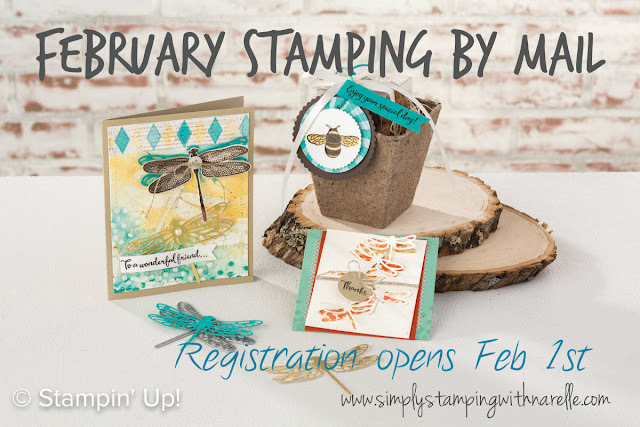 I just love dragonflies and the offering Stampin' Up! have given us is just gorgeous. So many possibilities. If you have never joined one of my Stamping By Mail classes and want to know how it works, the click HERE. This will give you the details of how they run. On Feb 1st that page will be updated with February's products and a new link to register.